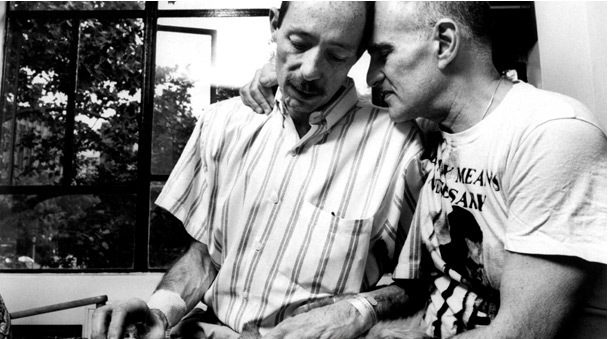 Larry Kramer (right) comforts Vito Russo in his California home several months before he died. Michael Schiavi wanted to write “The Celluloid Activist” because he couldn’t believe young gay activists didn’t know the scope of Vito Russo’s influence on gay America. Russo’s book, “The Celluloid Closet,” was just one aspect of Russo’s activism, both in and out of the movement, for LGBT civil rights and AIDS. His political life started during the Stonewall riots, where as Schiavi recounts, he was an observer the first night and a firebrand by the end of the weekend. He never stopped fighting, and he ended up on the front lines with Larry Kramer, to make the AIDS fight a political j’accuse against a system that wanted gays to disappear. Russo began as a starstruck gay kid in a repressed environment in New Jersey. In these chapters, Schiavi is rather slow out of the gate, with a florid style at times. Russo sought out gay subculture as a teen, spending as much time as he could with an out gay uncle and lesbian cousin, who included him in their social circles. After high school, he became a film student at NYU, eventually moving to Greenwich Village and jumping in head first in Manhattan gay nightlife. Schiavi writes robustly of the post-Stonewall era and its effect on Russo, who was starting to live the gay life out of the controlling eye of his family across the river in Jersey. He was hired by the glossy magazine After Dark, writing film reviews, but he was horrified at the publication’s closeted policies. The magazine, Schiavi explains, was aimed at a gay audience and even had male nudes, but to attract advertisers, posed as an “entertainment” magazine, the word gay scrubbed from the content. Russo criticized the periodical publicly before axing himself. Schiavi’s account of the burgeoning gay rights movement of the early 1970s in New York is comprehensive vis-à-vis Russo’s rise in the LGBT movement and, admirably, he catches the pulse of the time. Meanwhile, Russo was becoming a celebrity journalist, but also developing his thesis for “Celluloid Closet.” His lectures on gay representations in Hollywood films became a hot academic ticket at universities across the country. In demand, but desperate for money, he finally transformed the series into a book. Schiavi chronicles Russo’s sometimes rocky encounters, in the orbit of stars like Bette Midler and Lily Tomlin, who benefited from large gay audiences in their early careers. Of equal interest, thankfully because of Schiavi’s research, are Russo’s lovers, boyfriends and long-term relationships. Particularly moving are the many accounts of his friends coping with AIDS and survival. Russo’s star was rising on both coasts, but money and boyfriend problems continued as his public profile bloomed—Russo mobilized action behind the scenes and was out and proud in the media. He was host to the first LGBT talk show on TV in New York, he co-founded the gay media watchdog group GLAAD and he used his influence in Hollywood and New York to further LGBT causes. In the early ’80s, Russo put himself at the forefront of the AIDS war, politically, professionally and personally. Schiavi’s opening chapters are a bit static, but by the time Russo is checking out the action at Stonewall, this book takes off. Vito’s voice lives on these pages. The back half of the book, which covers Russo’s HIV-AIDS diagnosis, and his loss of friends and lovers, is intimate and unforgettable. The “Celluloid Closet” movie wasn’t produced until after Russo’s death, and Schiavi observes that it lacked not only the depth Russo’s book achieved, but also his political rage, which is definitely not missing in this authoritative and moving biography.